Every year, the Long Beach City Prosecutor’s office honors the “unsung heroes” of the city at its IMPACT Awards. But a day before Thursday night’s ceremony, City Prosecutor Doug Houbert found out one of the marque honorees wasn’t going to be able to attend. Long Beach Police Det. Steve Fox couldn’t make the ceremony because of a medical appointment he’d had scheduled for two years. Fox has rippling muscle disease, a form of muscular dystrophy, and he’s also been diagnosed with MGUS, which is a precursor to terminal cancer. 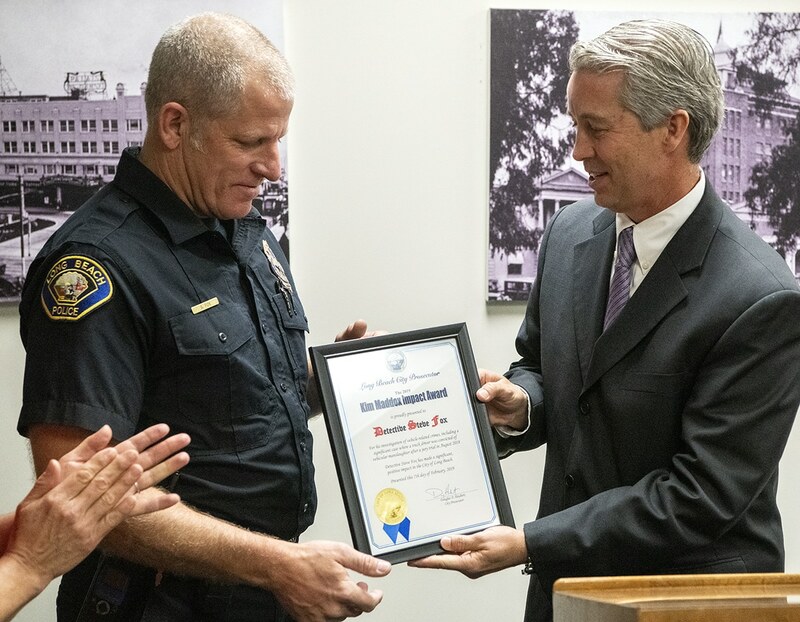 So Haubert and his staff set up an impromptu ceremony Thursday morning for Fox, who is this year’s recipient of the Kim Maddox award, an honor named after a Long Beach detective who died in 2016 from ovarian cancer. On Thursday morning, Maddox’s widow, Angel Macias, helped present the award. She hugged Fox. “Kim’s spirit is going to be with you and guiding you because you have a double bond: the blue bond and you have a bond with any time when somebody’s diagnosed with cancer; it just connects them,” Macias told him. 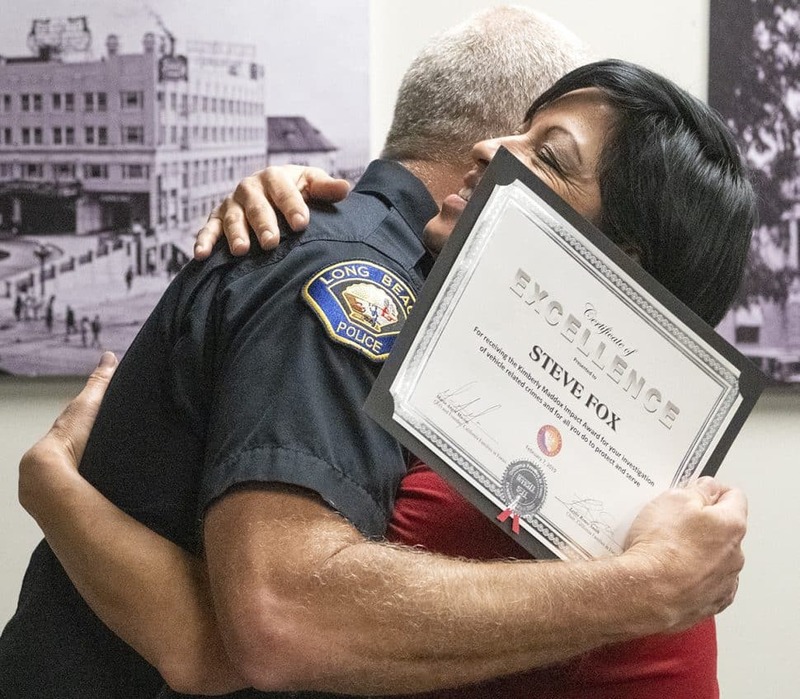 Angel Macias hugs Long Beach Police Det. Steve Fox after presenting him with the Kim Maddox IMPACT Award. Macias is the widow of Kim Maddox who was a Long Beach police detective. Photo by Thomas R Cordova. Prior to becoming a police officer in 1994, Fox was a professional race car driver in Canada for three years. He moved to California hoping to find a sponsor and continue racing, but was unable to, he said. He wanted a job with a little excitement, so he became a police officer. He was a patrol officer until 2013, when he started investigating traffic collisions for the department. He doesn’t talk much about his experience on the race track, but he said what he learned as a driver has stuck with him through to this job. “That’s why I enjoy this. I understand all the dynamics of a vehicle,” Fox said. He earned the Maddox award specifically for a 2016 case where a commercial truck driver hit a 63-year-old woman who was walking in a crosswalk. A jury convicted the driver of misdemeanor vehicular manslaughter in August 2018 and he was sentenced to 90 days in jail and three years of probation. The success of the case was largely due to Fox’s thorough investigation, said Stephanie Dowds, supervising deputy city prosecutor. “During the entire trial, he was there by my side the whole time, even in spite of his own medical concerns and difficulties that he was facing, he was there and able to get justice for that family,” Dowds said.